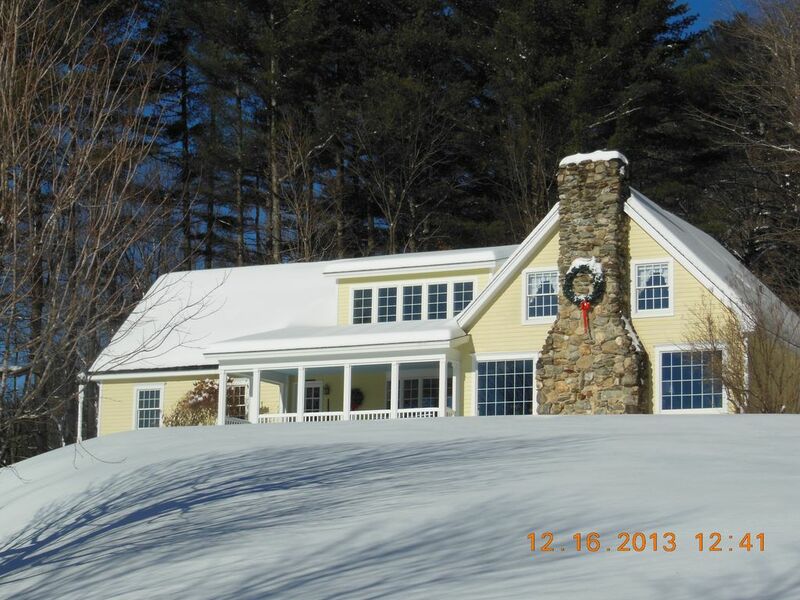 We invite you to enjoy our Cozy & spacious Vermont country home. On 20 private acres yet only 5 miles to Ski area. Great for three families or 6 couples or responsible groups. Perfect for family reunions. Serene Mountain views and a quiet country road. The neighbors house on our shared driveway is also available for family reunions, combined we can sleep 28-30 people. Great for groups attending summer weddings at Mountain Meadows or Golf vacations at Green Mountain National Golf Course. The large Country Kitchen has been totally updated and is fully equipped, adjoined by a den and living room with a huge Field stone fireplace. A separate family room has an updated auxiliary kitchen and includes a TV, DVD, pull out couch and adjoining Bedroom and bath. The back deck has a 5 person Hot Tub. There is game room in the semi finished basement, also lots of space for taking off all the ski clothes and ski racks and boot bins near the door to the garage. Green Mountain National Golf Course is 2 miles down the road. While Vermont has some of the finest golf courses in the Northeast, none can match the beauty and design of Green Mountain National Golf Course in Killington. Voted the No. 1 golf course in Vermont, the exceptional layout and dedication to service offers a great experience for golfers of all ability levels. Located in the heart of Central Vermont, just minutes away from the Killington Resort, we are only 2 miles down our country road to Rt. 100 and within minutes of the course. Plus, the Killington region offers many great activities and events for you and your family to enjoy during your visit. Green Mountain National is also perfect for your next Vermont golf outing or tournament. They specialize in golf instruction as well as a activities designed specifically for women golfers. Killington Ski Resort has the Biggest & Best Skiing In The East: Known as the Beast in the East! Killington Resort is home to the most extensive variety of terrain in the east. Your lift ticket is also valid at Pico Mountain. We have all the skiing you could ask for. Challenging steeps and glades. Smooth cruisers, Gentle learning terrain, and freestyle terrain. Skiing and Snowboarding. A Great snow play area for children serviced by Magic Carpets, a great place for first timers! Ski and snowboard school for all ages. Convenient, Fresh & Clean. Partially updated. All dishes, Pots and Pans and utensils are provided. Service for 16 plus plenty of extras. We leave the house stocked with spices, vinegar and oil. Also Sugar and flour, teabags and trashbags, sandwich bags. As the season goes on these items my get depleted. Extra tables in Family room or Living room. Bring your own i Phone or i Pod. We provide a player. Not available in summer. Winter use only accommodates 4-5. Extra Dining space in family room and living room in winter on Porch in summer. All bed linens and towels provided. Bring your own beach towels for hot tub in winter. Hot tub is empty in summer. Just ask and we can recommend a Chef that will come in and cook for you. He'll do all the shopping and clean up after a delicious meal. We can tell you the best restaurants, and give you the best directions to the lifts or nightlife. Hate being back from our wonderful, long weekend in Killington - this was the perfect house for our group of 16! Everybody loved it - from the great location and beautiful accommodations, the amenities, the beds, the hot tub - it was all great! The kitchen was stocked with everything you need, everything was clean and comfortable. The owner was quick to answer any questions and was very helpful - there are no complaints and everyone is definitely interested in renting this house again! We are so Happy that you loved the house as much as we do! We make every effort to be sure our guests have everything they need. When our guests are happy we are happy! Come again! Great space for a large group! Our group has rented the house for the past two years and each time has been great! The house has ample sleeping and relaxing space for a large group and the large dining room table is perfect for group dinners. The kitchen is fully equipped for cooking a meal and the house has essentials (such as linens) so that you can travel lightly. LOVE the fireplace and hot tub for relaxing after a day on the mountain. Overall great experience and can't wait for next year! Stayed at this house last weekend with a group of 14 and the house was amazing!! Even nicer than the photos. The hot tub, fireplace and comfortable sleeping arrangements were the highlights. We would rent this house again in a heartbeat. We were very pleased with Alli and her group of skiers. We are always happy when our guests love the house as much as we do! We have a check list posted on the refrigerator for the guests help when we have back to back renters. Alli helped with all that we asked. My housekeeper even called to tell me how nicely they left the house. We will be pleased to have Alli and her friends come again anytime! Thanks Alli and friends, Please come again! Thanks so much for your review. We too love the fireplace! When we rent a ski house or beach house we too appreciate all the condiments, tea, spices, olive oil etc.! Please come and enjoy our ski house again. Summer in Vermont is beautiful too! Diane's house was very spacious, very clean and has plenty of beds. It is located just minutes from the base of Killington Mountain. Anytime I emailed Diane with a question she was very prompt with her responses. She was a real pleasure to rent from. Thanks Pete, We Love to hear that you enjoyed the house as much as we do! Everyone loves how spacious yet cozy the house is and lot's of room for family and friends! Please come again, we love having repeat guests. Beautiful Central Vermont. In Killington (5 miles) and near Okemo Ski areas (20 miles). Great central location for summer exploring the state. To the west (20 miles) is the historic and quaint village of Woodstock home of the famous Woodstock Inn and Resort, near Green Mountain Horse Assn. in S. Woodstock and The Billings Farm and National Park, with gentle hiking (carriage) trails. Farther to the west is the Connecticut River dividing the state from New Hampshire and the home of Dartmouth College in Hanover, NH. To the west is Rutland (20) miles and Middlebury (40) miles. Convenient for Antique enthusiasts, Equestrians, Hiking, Biking, Fishing, Kayaking, Canoeing, Tubing on the White River or in the many lakes and streams. Ride the chair lift in summer and bring your bike for some awesome mountain biking. Sophisticated Outlet shopping in the charming village of Manchester 45 minutes away. Or just relax in summer on the screened porch with a good book. Or sit by the fire in winter. Golf: 2 Golf courses, Green Mountain National is 2 miles away, Killington Golf Course is 5 miles away. Ski: Killington Ski and Summer Resort consists of seven mountains with a network of 200 trails for skiing and snowboarding. 50 miles of Mountain Biking terrain, 45 miles of Hiking Trails Killington is the largest in the east and Killington Peak is 4,241 feet high.